Simplicity are completely synonymous with sewing and easy to follow patterns, so I was delighted when I was contacted recently to chose my favourite patterns to share with you. The Simplicity website is really easy to use, packed with great patterns and provides all the information you need to chose your pattern, it clearly shows you the guide to what type and how much fabric you need. I am giving away one pattern to each winner so there will be three winners! 1 - Leave a comment letting me know which of the three patterns you would like if you won. 2 - Spread the word about the giveaway - blog, tweet, pin or share this post on facebook and let me know you did in a separate comment. 3 - Follow my blog and let me know in a separate comment. PLEASE leave your email in the comment, no reply bloggers will not win. The giveaway is open until 22nd August, the winners will be chosen by random.org and announced here on the blog. You've picked such fabulous patterns!! I love the pants in the first pattern, so cool! I think I'd choose the first pattern, mainly because it looks the easiest!! Whilst my favourite pattern is pattern three I'd got for pattern two as three looks like something I'd love to wear but could never make! Oooo Yay for your giveaway!! New Look 6148 looks like a pattern I could make and wear!! I like the New Look pattern! I think I'd go for the dress, it's lovely. I'm pretty curvy and I do think it might be flattering. With that in mind, the top would be my number 2 choice. I choose the last one! I love the 40's pattern, it's beautiful. All the patterns have something that appeals to me so can I make it easy for you and say I'd take any of them if my number came up? Great giveaway Lucy! 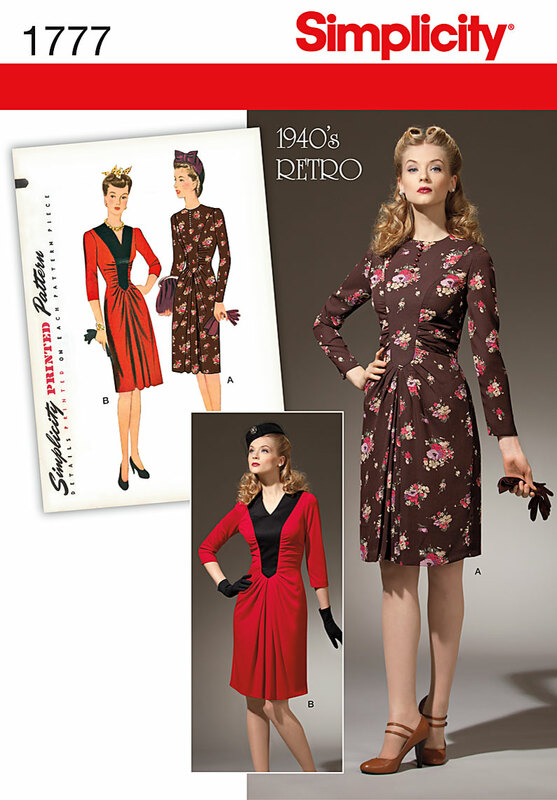 If I should win, I would select that retro dress. I think it would be a challenge to sew, but it looks so good! can see it in a lot of different fabrics! And I'm off to tell all about it on Facebook! I am a follower :) I have been thinking about branching out into sewing garments - maybe? I'd have to go for the second pattern - it looks easier to sew and I'd be more likely to wear it! I would love the New Look one. That outfit is awesome. Thanks for the chance. Thanks for the chance to win, Lucy. I'd choose the New Look top. I can see lots of possibilities for wearing with skinny jeans and leggings. I didn't realise Simplicity was still going! All the patterns are great but I like the tunic top the best. I am also already a follower! These are all very cute. I would choose pattern 1617, the pants/skirt pattern. Thanks for introducing me to these patterns!